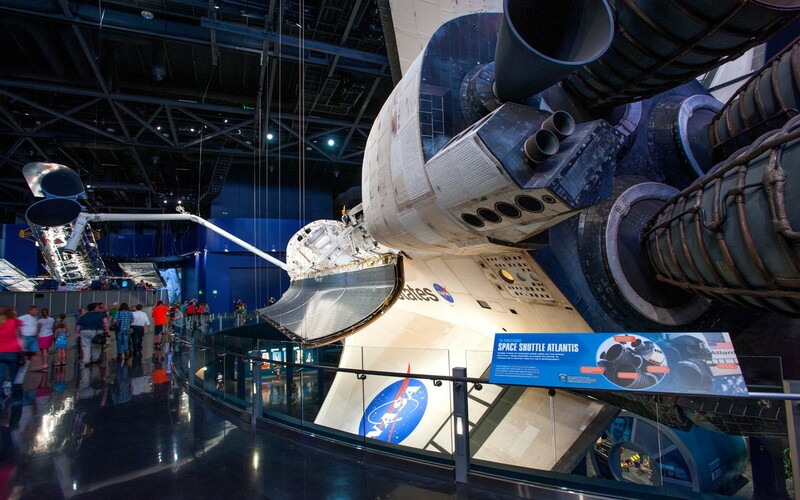 The space shuttle Atlantis is the centerpiece of a new 90,000 square feet museum at the Kennedy Space Center. 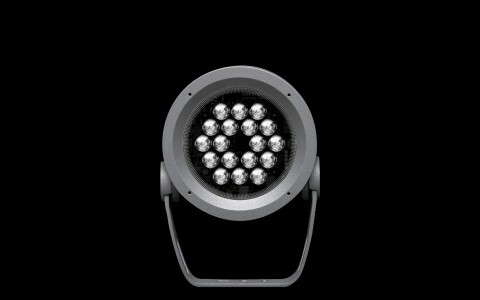 Working with architects PGAV Destinations, designers Fisher Marantz Stone used light to show the orbiter as it would look in space. The lighting design heighten's the drama of the shuttle, which is suspended 30 feet in the air and tilted, allowing 360-degree views. 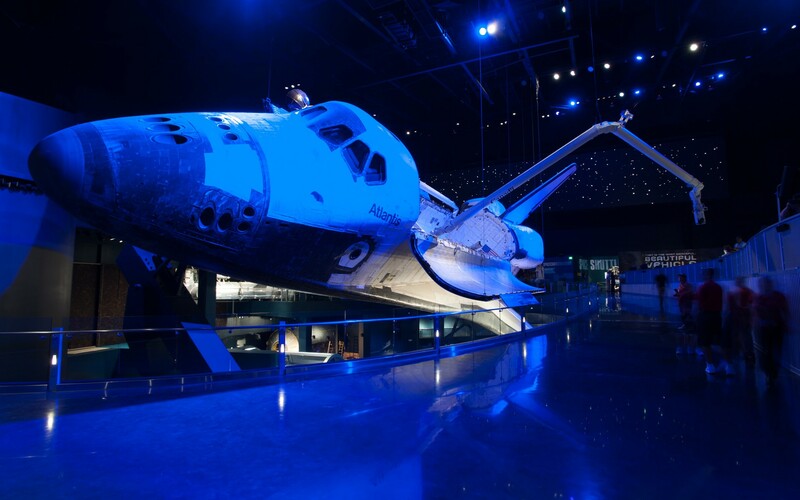 To ensure reliability and to simplify maintenance issues, the Kennedy Space Center required the use of LED fixtures for the shuttle's illumination. Using the museum’s catwalks, Fisher Marantz Stone aimed the luminaires towards the shuttle, making the orbiter glow against the darkened backdrop. 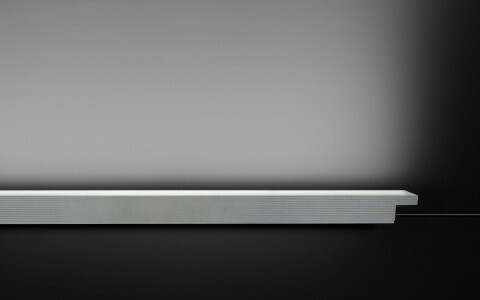 The firm chose Lumenpulse's Lumenbeam fixtures, using White, Dynamic White and custom Blue to simulate the reflection of sunlight in space. Orange and gold represent the heat and colors of re-entry. Fisher Marantz Stone then used a range of linear Lumenfacade fixtures to maintain the mood and properly illuminate the surrounding exhibits and circulation areas. The end result gives Atlantis the send off it deserves, dramatically displaying the shuttle as if it were still in action. 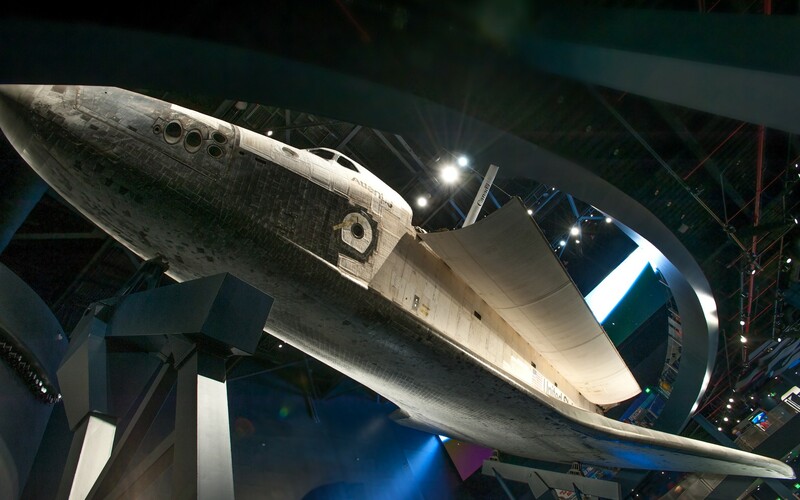 Using Lumenpulse LED fixtures, Fisher Marantz Stone created a dynamic lighting scheme for the new $100 million space shuttle Atlantis exhibit, simulating outer space to reveal the orbiter in full, dramatic flight mode. 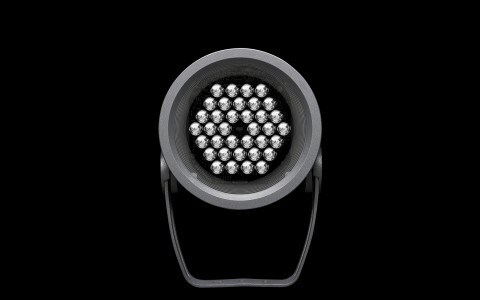 Form factor and flexibility were essential to this project, and the Lumenpulse fixtures were a perfect fit, particularly since they offered tighter distribution options in high-wattage, high-lumen packages. 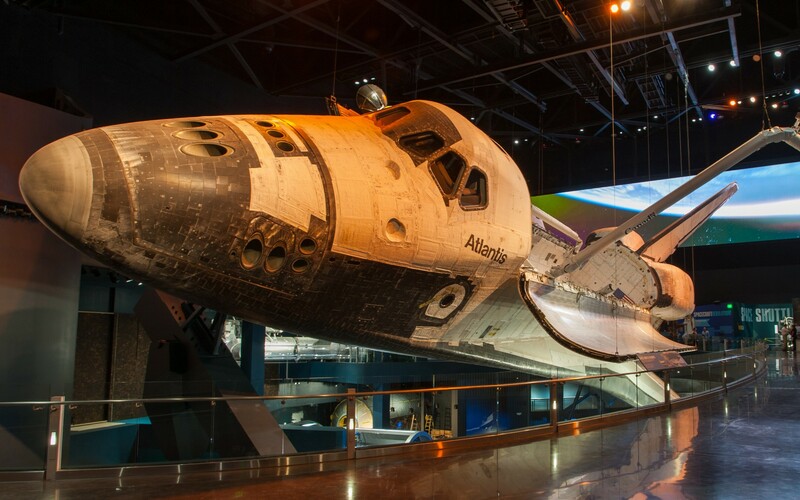 The Atlantis Shuttle Experience, a new 90,000 square feet museum at the Kennedy Space Center, is boldly going where no other has gone before: displaying an orbiter in full flight. 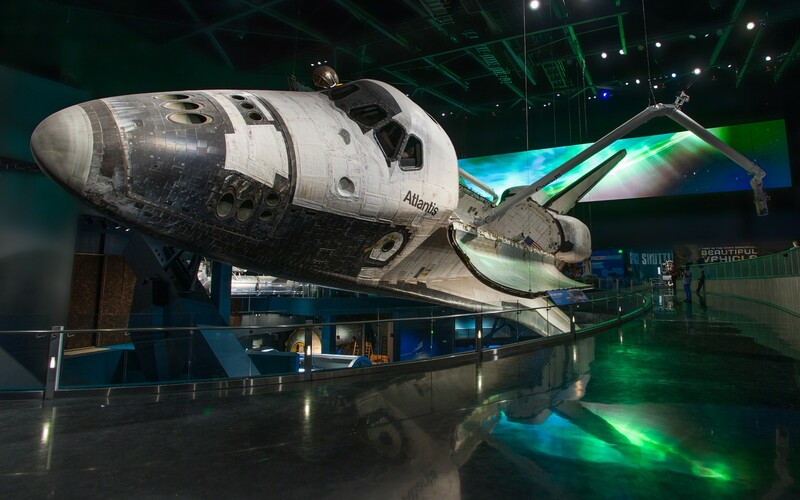 Dedicated to NASA's Space Shuttle Program, the $100 million exhibit has suspended Atlantis 30 feet in the air and tilted it, allowing 360-degree views of the orbiter, as it would look in space. Working closely with architects PGAV Destinations, design firm Fisher Marantz Stone set out to develop a lighting scheme that would heighten the shuttle's striking appearance, while also paying homage to its hard-working past. "We were going for drama - no one wanted the shuttle to look like it was in a white museum space," said Paula Martinez-Nobles, Project Manager at Fisher Marantz Stone. 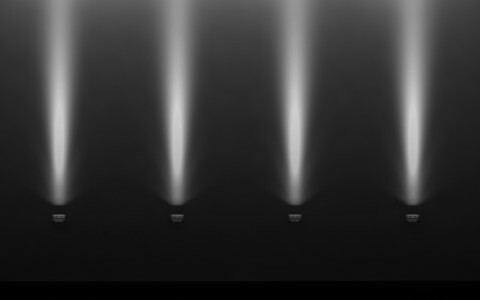 "The main objective was to have it appear as if it were coming off the International Space Station, to mimic what would happen in space, with sunlight reflecting off its surface in a dark environment." 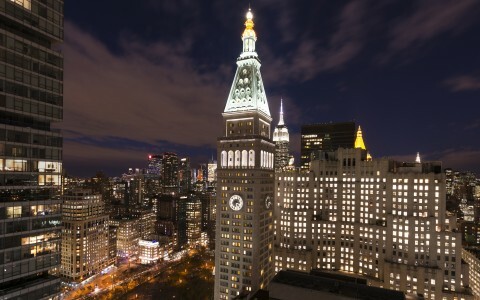 To achieve this astral effect, Fisher Marantz Stone chose Lumenpulse LED fixtures. 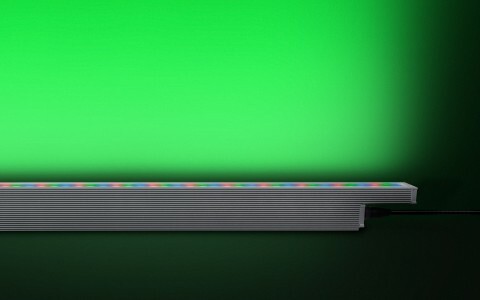 "Form factor and flexibility were essential to this project, and the Lumenpulse fixtures were a perfect fit, particularly since they offered tighter distribution options in high-wattage, high lumen packages," Martinez-Nobles said, adding that the Kennedy Space Center had pushed for the use of LED technology. 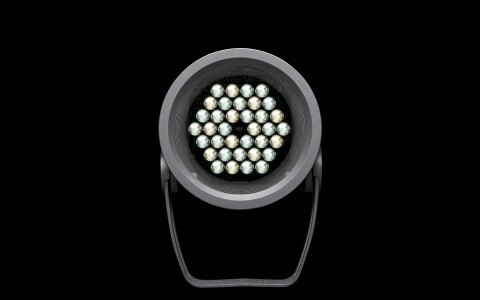 "The Space Center wanted to ensure reliability and simplify maintenance issues - they didn't want to crawl above the orbiter to change light bulbs every few months - so using LED fixtures was a requirement," she said. 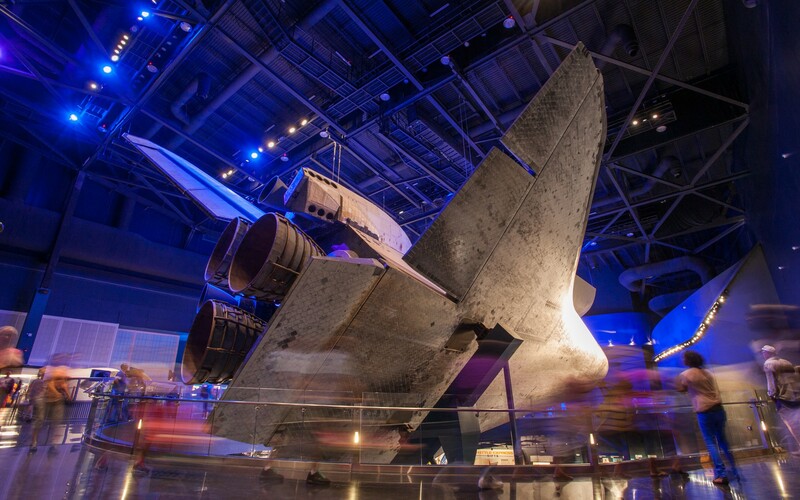 Fisher Marantz Stone chose a variety of Lumenbeam family luminaires to light the space shuttle, using Lumenpulse's Dynamic White technology to blend 2700K, 4000k and 6500K color temperatures. 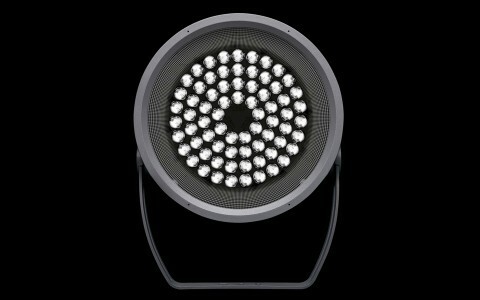 In order to faithfully recreate the unusual lighting conditions in space, however, special Lumenbeam XLarge luminaires - mixing blue and amber LEDs - were also developed. The museum's catwalks and viewing galleries are used to aim over 250 luminaires towards the wings and body of the shuttle, highlighting specific elements and making the orbiter radiate against the backdrop of a giant LED screen. 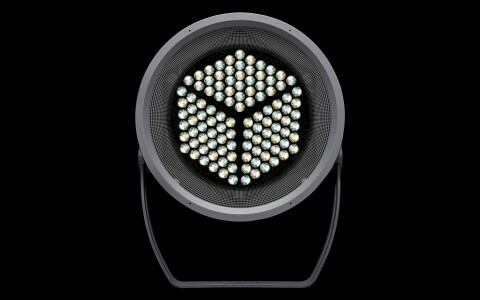 "The shuttle is clearly the star attraction, so the design works to ensure that it's the brightest thing in the room. 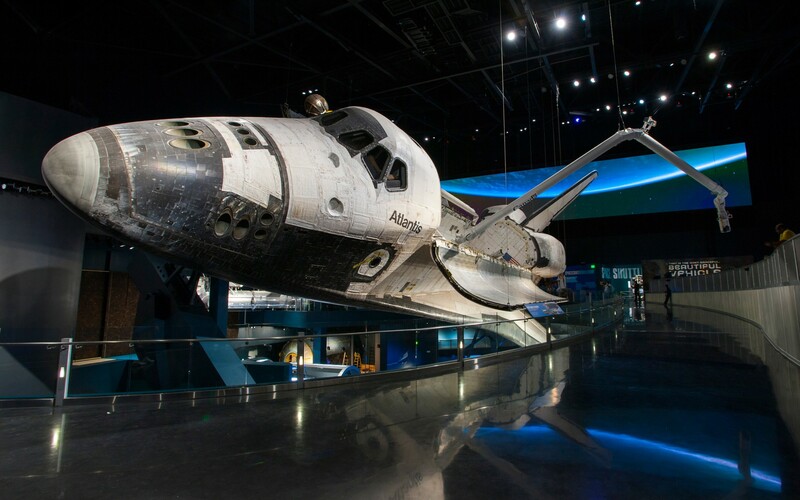 But in order to tell the full story, we also had to highlight the 60 different exhibits around the shuttle - without overpowering it," Martinez-Nobles said. To manage this fine balance, Fisher Marantz Stone used a range of linear Lumenfacade fixtures to subtly illuminate the exhibits and circulation areas leading to the shuttle. 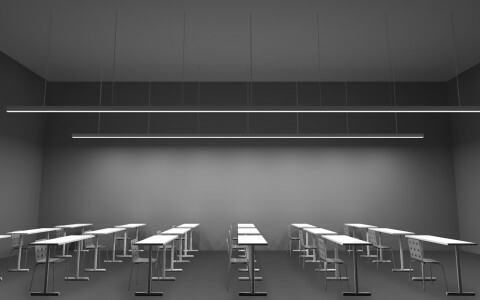 This provides enough direct light for the exhibits, while also setting the right mood for the final, dramatic orbiter reveal. "It takes you through this experience, to really show the story of the shuttle program," Martinez-Nobles said, describing how the museum has provided the shuttle with a dramatic, and fitting, send off. "When you're in the Pre-Show theatre, you don't know she is right behind the projection screen. Suddenly, she appears from behind the scrim, and you're transported…nose to nose with her in mid-flight."